This stage is characterized by the need for process management. Organizations have a regular schedule and larger scope, requiring more resources, technology and processes. Risks are tangible. The Brute-Force stage in foreign language translation management is a important moment as there is a threat of overspending if the organization does not support global communication improvements. In fact, we feel it is the most important stage in growth as organizations have to invest time and resources to overcome barriers of growth that may happen in the future. This stage requires disproportional process attention over financial means and financial outcomes, which is what makes this stage a challenge. Looking at the Global Communication Maturity Model, the Brute-Force stage is characterized by repetitive projects requiring more resources, technology and processes. Those resources are often still found at the vendor side, but organizations need to help enable those resources. What’s important at this stage is that an organization is open to involve that Language Service Provider (LSP) in managing projects with the organization. Content strategies, writing and design strategies and organizational strategies can help to mitigate risks. Process management in all of those areas protects budgets and prepares the organization for growth. Our client was selling an incentive reward program to Fortune 500 companies. We had been involved in several sales cycles to get their online portal translated for their client’s specific need. The portals were all customized for each customer, sales cycle was long and the sales process was not very repetitive. Through collaboration with our client, we translated the basics of the portal in several languages as a way to demonstrate their portal to different markets. Further customization could be ordered as needed. It helped our client to sell a multilingual solution to their client without having to reinvent the wheel. It also greatly reduced the upfront investment needed to attract a new client as their solution already provided 80% of what their clients needed from their client in several different languages. 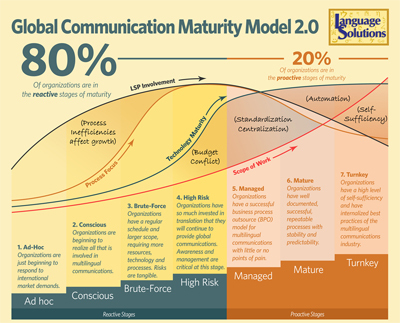 Global Communication Maturity Model shows Brute-Force stage needing more resources, technology & processes. In order to build a systematic process you need to involve a team of people with various disciplines. In the previous case study, the success of this program was that we worked together with both the Account Managers who were involved in the sales and scoping process, the Programming Team and Department Leads who can enable these resources to work together. It was clear that this team was passionate about getting it right. Several attempts had been made in the past to get a global solution to their clients, but this was the first time the department was in line with all their account managers on how to handle a global rollout in the future. Management buy-in is very important at this stage. We’ve seen these types of case studies either succeed or fail based on whether there was a passionate management team involved that could free up resources and manage the process. The management team needs to be able to look down the road and see opportunities for global expansion through systematic processes. The term SMART Goals may be overused, but this stage can’t be managed without a goal oriented approach. We have done something similar to the client in this case study with our Localization Maturity program. We have defined a standard set of objectives based on years of research and best practices that we can apply to any stage of growth. This was the most involved objective that we worked on. For the portal, we had to decide what languages would be chosen and what content needed translation. Based on our client’s cultural research on participation rates and incentive reward preferences and our research on Hofstede’s dimensions, we defined the main markets that the basic portal would be translated into. Based on that and other figures, we determined what countries would have similar preferences to the English model that already existed. We’ve also defined those modules that may need to be customized for other countries so that customization can be accelerated. This objective was met with other objectives that involved collaboration on standardization for coding, standardization of terminology and standardization of release of files for translation. We introduced Terminology Management and Translation Memory Management early on and created a standard database for the portal to be used consistently for every client who wishes to use the portal in the markets we have translated it. This ensured that customized content was consistent with the basis portal that has already been created. The Programming Team and Project Team standardized their approach with us to deliver content in a predictable manner, shortening the time to get customized content through. More Account Managers started to use the basic portal in their sales cycle without needing our immediate involvement. We’ve also looked at content management technology solutions down the road to prepare the team for further automation. The Brute-Force stage is all about enabling people to work together on meaningful process improvements. This stage is a true test of management to capitalize global opportunities into a competitive advantage. We also find that this stage can be very polarizing. Some clients are just not ready to take on the opportunity and we’ve seen dramatic decline in global efforts from that. Those that have taken the challenges faced in this stage have since taken on more global oriented projects and are using it in their own careers and work as a competitive advantage.